Houses & Homes VA: Instant Curb Appeal for Amateurs! Instant Curb Appeal for Amateurs! Whether you are selling or staying you want your home to look its best, right? Here are some great ways to dramatically upgrade the outside appearance of your home for very little money. If your house numbers are old or faded they can really detract from your home’s appearance. Today there are many choices available including stainless steel, aluminum, brass, wood and other finishes. You can even find different colors to match the existing exterior paint. This is a great way to make a statement for very little time and effort. A new light fixture on the front of your home can add beauty and be functional as well. Why not replace the existing fixture with one that has a built in motion detector? There are a lot of choices here and it’s easy to find one that’s just right for the look of your home. Few things give a home as inviting an appearance as beautiful flowers. Adding flower boxes under the windows on the front of your home is a great way to create that cozy and inviting feel without spending a fortune. Just the same as faded house numbers or dull lighting, an unattractive mailbox can really affect the way that people view your home. There is an almost unlimited variety of mailboxes available today and some even allow for a bit of your personality to come through. I knew a police officer once who had a mailbox shaped like a badge! I’m not saying that you need to go that far but the point is that you can make a unique statement and still beautify the exterior of your home. Decorative shutters add a lot of character to a house and there are many styles to choose from. They can be mounted over any type of home exterior and are another great way to add some color and flair to the outside. Another benefit is that they are available to fit almost any budget. If your walkway is in decent condition it’s a very simple matter to line each side of it with decorative pavers. You’ve seen them before; those attractive rocks or bricks that border both sides of a concrete walking path. They are available in clay, concrete or stone and there is a large variety to choose from. They make the yard look great and help to give it that professionally landscaped look. There is a bit of work involved but it’s pretty simple and the results are well worth the effort. If you have a boring or weather beaten storm door or none at all it’s a good time to consider an upgrade. Today’s storm doors can add security, protect the inner door and help to save money on energy costs as well. I’ve seen some gorgeous screen doors for a very reasonable price including those with some very attractive etched glass or stained glass patterns. A new screen door goes a long way in enhancing the beauty of your home. 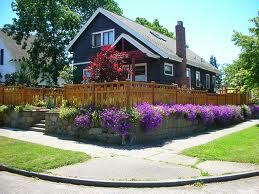 Adding color and providing character to your yard (especially the front) is a definite attention getter! Varied plants, shrubbery and well placed trees will add some real spark to that front lawn and is limited only by your imagination and ingenuity. Even very small yards look great with some well placed greenery and it helps to create a very peaceful and serene environment. This is one of my favorite and least expensive solutions to enhance the appearance of the outside of a home. Low voltage lighting makes any home look great at night and also improves security. You can add light to walkways, highlight your flower boxes or landscaping, or simply give the entire front of your home a warm and inviting glow! Alright, you knew this was coming. Yes, you MUST paint again! Few things take away from the beauty of a home than dull, peeling or mismatched paint. If the exterior of your home is in need of a new coat than now is the time. This is your chance to change the color for a different look if you prefer. A point worth knowing: White paint will make a smaller home look bigger so it’s a good idea to keep it bright if you have a modest sized home. Finally, you are much better off spending a few extra dollars and buying high quality paint. The difference in cost is minimal and you will see a difference in the results.